Abandoned sections of the former Great Western Railway route from Morfa Mawddach (Barmouth Junction) to Ruabon line which closed in the 1960s. Two sections of this line have since been reopened as the Bala Lake Railway and Llangollen Railway. Photographs of these sections can be found elsewhere on this web site. 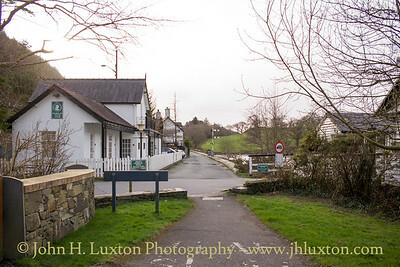 View along the former track bed towards Dolgellau showing the building on the right is the George III hotel which has now expanded into the nearby former station house / station building. Restored signal on the approach to Penmaenpool Station. 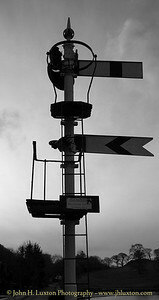 Contemporary photographs suggest this is not the original signal present at the time the railway closed but one which has been installed at a later date. Next to the signal can be seen the ferry steps. 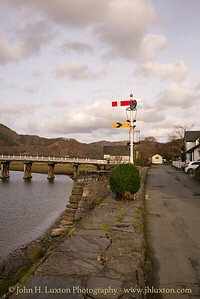 It was whilst attempting to land passengers here that the under manned passenger ferry PRINCE OF WALES became holed after striking Penmaenpool Bridge and sank with the loss of 15 passengers on July 22, 1966. Restored signal on the approach to Penmaenpool Station. Contemporary photographs suggest this is not the original signal present at the time the railway closed but one which has been installed at a later date. Next to the signal are the ferry steps. It was whilst attempting to land passengers here that the under manned passenger ferry PRINCE OF WALES became holed and sank with the loss of 15 passengers in the summer of 1966. 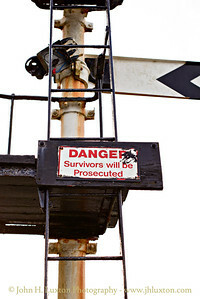 Perhaps intended as a deterrent to those considering climbing the signal ladder the intended amusing notice on the signal ladder "DANGER Survivors will be prosecuted" appears a little insensitive given that the PRINCE OF WALES ferry disaster occurred next to the location of this signal. 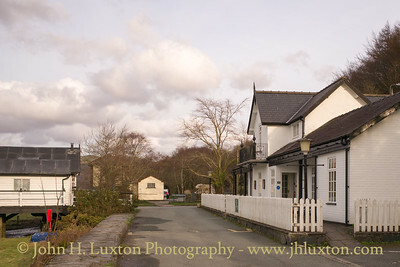 Penmaenpool Station house and ticket office (right) which is now an annex to the nearby George III Hotel. 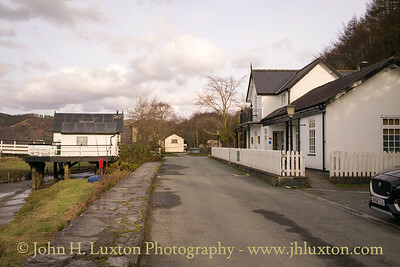 The station platforms were located on the other side of the level crossing which gave access to the Penmaenpool Toll Bridge seen on the left. 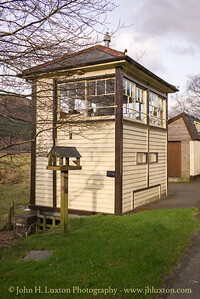 Penmaenpool Station Signal Box has been used as an RSPB Office and Bird Watching location for many years. 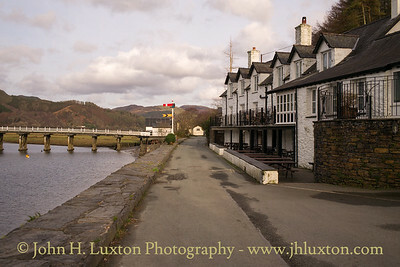 Site of the level crossing looking towards Morfa Mawddach. 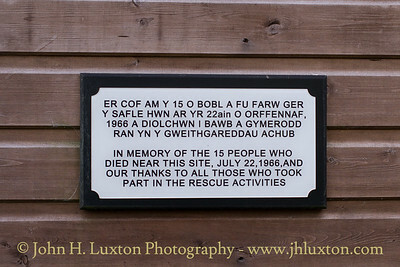 Erected on the site of the platform is a bird hide and affixed to this is a memorial plaque commemorating those who died in the PRINCE OF WALES ferry disaster on July 22, 1966. Surprisingly the plaque does not explain what the nature of the disaster was which appears unusual. 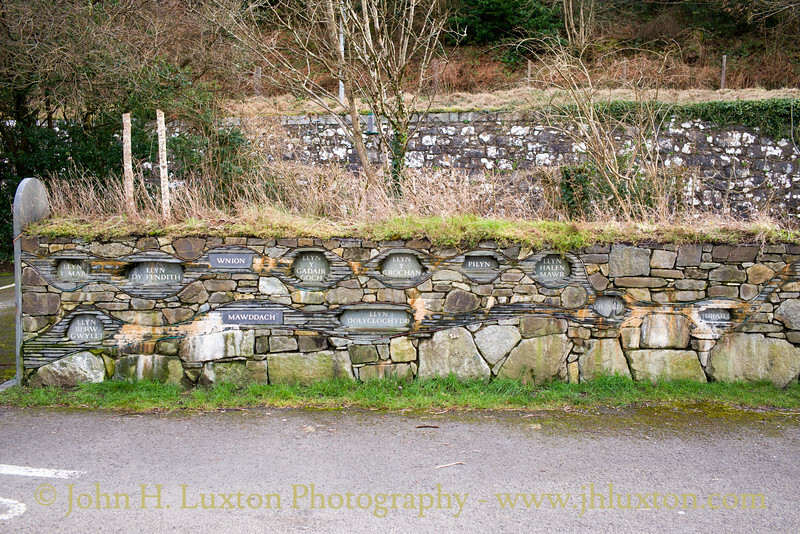 The names of local rivers and lakes built into a wall beside the track bed.